Over Football’s Super Bowl weekend, I visited my parents in my hometown of Pierre, South Dakota. 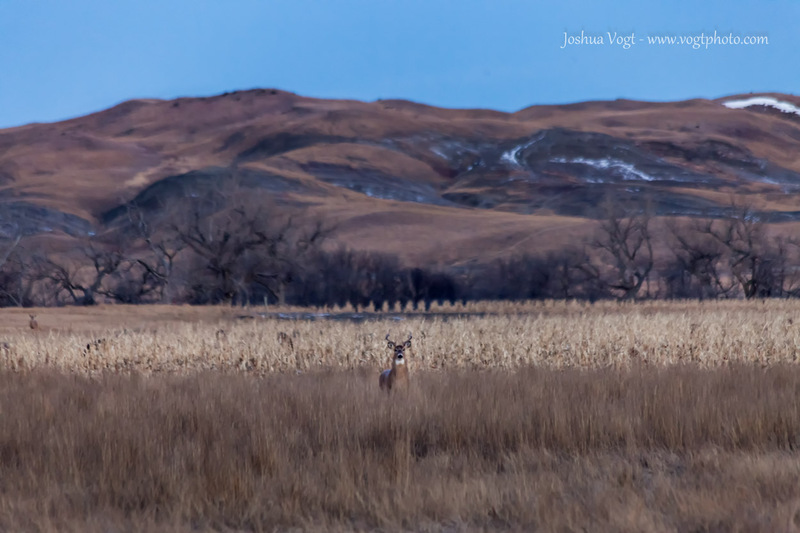 On that bitterly cold Sunday morning, I took a drive down the Bad River Road outside Fort Pierre to see what I could see. What I saw was a disappointing lack of snow in the area. 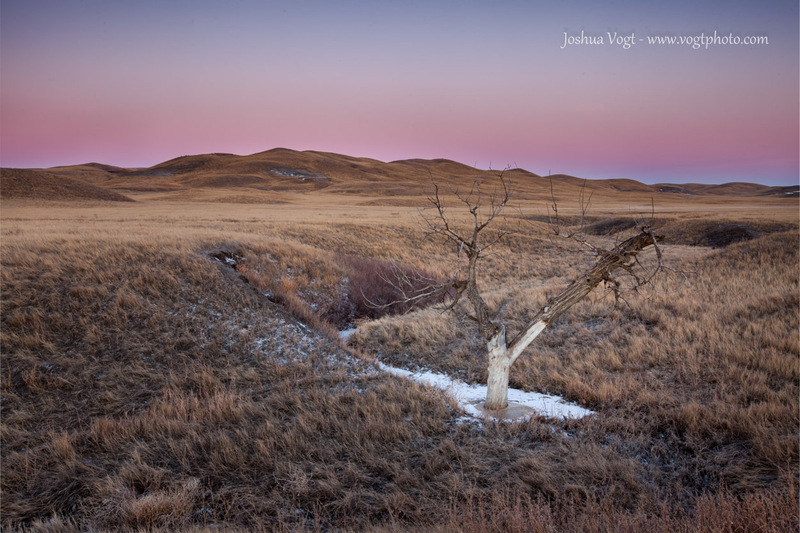 I’ve been down the Bad River Road in the fall when the prairie has gone dormant and turned brown, so I was really hoping to get some prairie shots with snow! Even though I was bummed at the lack of snow, I quickly took notice of the hundreds of deer that were calling this area home for the winter. I rarely seek out wildlife photos, but with literally hundreds of deer running about, I turned my mood around and kept my camera at the ready. I thought the deer in the above shot was thinking, “Whatcha looking at?” I was able to only get off a few hand held shots from my truck before he turned tail and ran off, taking his friends with him. Can you spot this buck’s friends? Once twilight waned and the sun began to rise, I headed to a small creek bottom that I thought would make interesting leading lines in an image. I took a few shots of the image I originally had in mind, but was feeling uninspired. 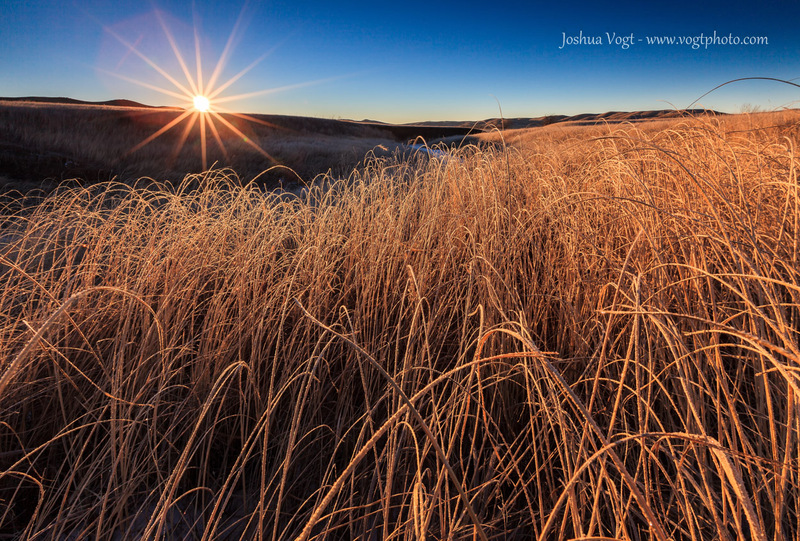 But once the sun broke the horizon, it lit up the long grass near the creek, and with the frost beginning to melt off the grass, made it appear to glow. I crouched down really close to the ground and positioned my camera just a few inches away from an area of grass that was untrammeled and blasted off this image; it turned out to be my favorite image of the trip.